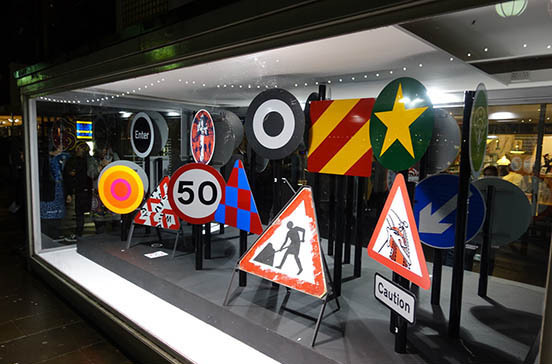 We were asked, along with 49 other designers and artists, to create an homage to the great British road sign - to mark the 50th anniversary of the scheme, in an exhibition at London's Design Museum. We had already come up with a different concept for the road signs, using the metaphor of animals. So we turned our attention to the vexed issue of the pavement that runs alongside the roads. 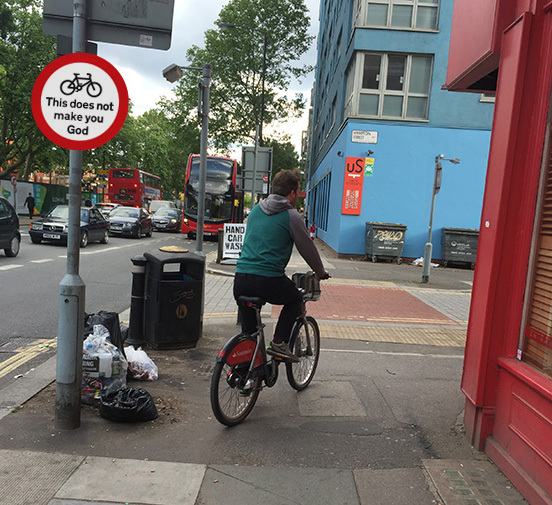 Does the pavement need signs to help protect pedestrians? Roads and pavements share the public space. 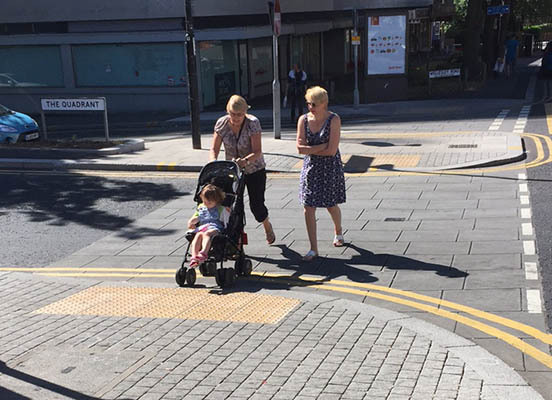 A pavement never ends, it links invisibly across a road, a fact only very rarely made physical by things like zebra crossings. In some, preciously rare, instances the powers that be continue street paving over a road to make the links literal. Using surfaces to show drivers that part of the road is shared, with vulnerable pedestrians. People driving want to drive. They don't want to slow down, least of all stop, for a second longer than is absolutely legally necessary. People climbing into a car, or swinging their leg over a bike, are possessed by the Spirit of Velocity from the Vorticist era, a Spirit that glories in speed, and the invulnerability of gleaming metal. Pedestrians are intruding. The passion in what I write here is because I don't drive. I walk. I am a life-long pedestrian. All my time is spend on pavements and crossing roads, dodging cars, and increasingly cyclists. 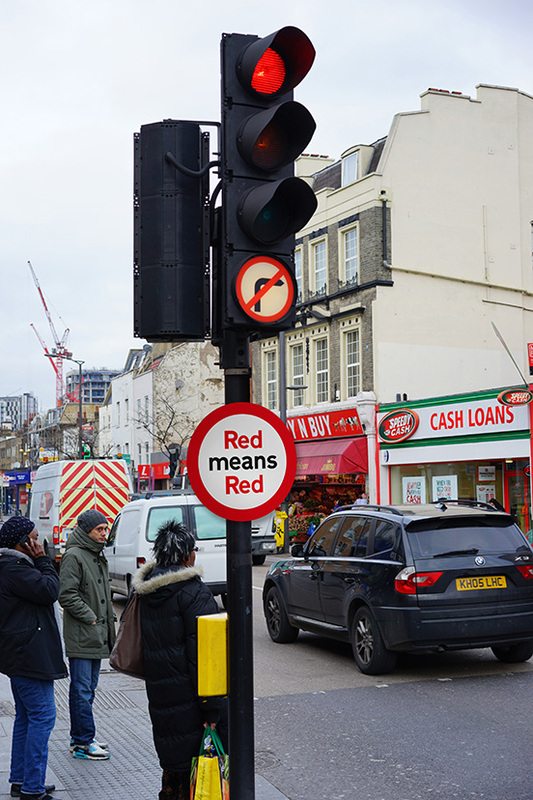 Our first sign, to protect pedestrians: urging cars not to jump red lights, or put another way, urging cars not to put pedestrians at risk when it is their turn to use the shared space. Cars regularly ignore the lights on Walworth Road. What happened with cyclists? There are a few, often on Boris bikes, wobbling about, new to the area, unsure of where to go, cycling at a gentle let-me-see-where-am-I kind of speed. But there is a new breed, I first encountered in Amsterdam. The hardened, hurtling, I-ain't-stopping cyclist, often on a racing cycle. This kind scream at pedestrians. I'd understand it if the screams came when pedestrians were dithering on the road in the way of cyclists who had right of way, but I have been screamed at crossing lights that were green for me, as cyclists whizzed through red lights, and, most alarmingly, walking on the pavement. Speeding along a pavement on a steel vehicle. Signs have gone up in Stockholm, warning pedestrians of a new threat, pedestrians using their smart phones whilst walking. A year or so ago, several accidents were reported caused by people so absorbed by playing Pokémon Go they stepped out into speeding traffic. After we make the pavements safe by stopping cars jumping red lights, and encouraging cyclists to use only the roads, we have a new risk to mitigate: the zombie phone user. 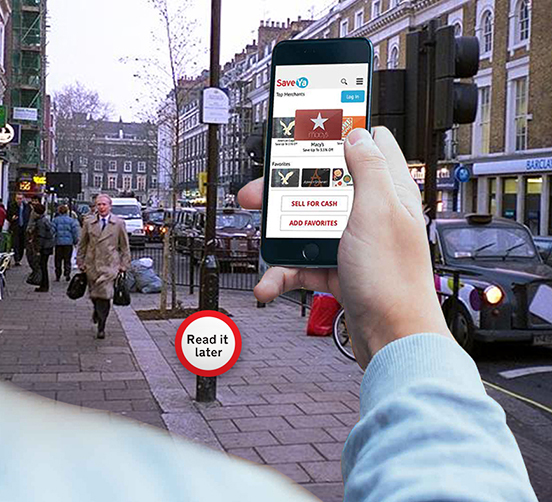 We suggest signs placed low down, the only sliver of the phone-user's vision not filled by the phone screen. Smart phones make us dumb - waking as if in a digital dreamworld. Celebratory exhibition at London's Design Museum.